facilitate linkages to commercial partners, to increase opportunities for research investment and commercialisation. AgriBio is an open and inspiring place to work. Consisting of a beautiful four-sided building where each facade is treated equally, to generate the maximum window space. The result is natural daylight at every level across both laboratory and office space. 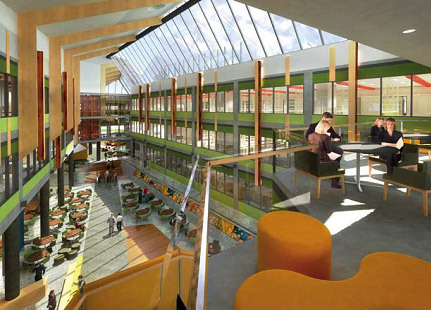 The social spaces are located in the sky-lit atrium to create a focus for collaborative endeavour so vital to successful research. AgriBio has gained certification under the Green Star Education tool as a five-star-rated building. The main building’s facade incorporates external vertical shading fins, scientifically designed to optimise the balance between natural light and thermal efficiency. AgriBio is a workplace that is highly flexible, allowing research directions to evolve and adapt as technology and accreditation requirements change over time. Integrated into the natural bush setting AgriBio is an exceptional work place that will help retain and attract the very best research scientists. From its conception AgriBio has had AQIS approved third party certifier support to provide guidance through the complex accreditation requirements and provide feedback on laboratory design and operations solutions. In the design development and construction phase they have been on hand to directly engage with the certification process, comprehensively test system integrity for compliance and consult with user groups and ensure quality assurance systems are in place. AgriBio’s design is complimented by the 2,600 square metres of expansion space within the new facility. This space will accommodate a variety of growth scenarios such external complimentary tenants or the future expansion of the AgriBio staff over the next 25 years, thereby future proofing the JV’s investment.